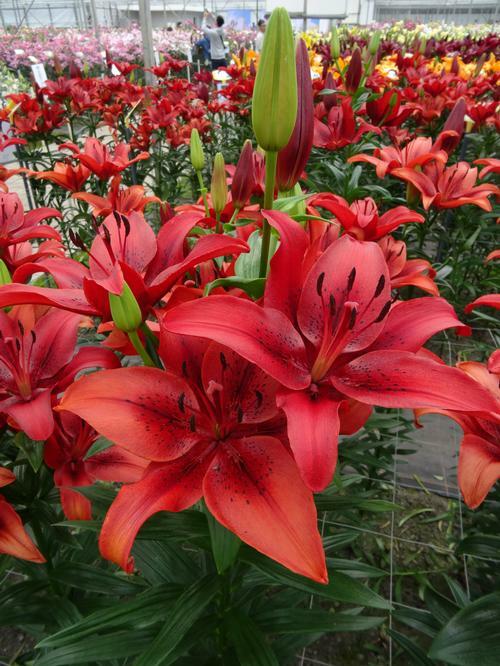 Large showy upward-facing blooms, a bowl-shaped flower of deep orange-red with darker spotting towards the throat, a robust disease resistant plant, produces 3-5 flowers per stem. Plant in neutral, well-drained, hummus-rich soil, plant scaled bulb 6" deep. Superior hybrids from crossing L asiatic x L. longiflorum. Flowers are much larger and more funnel shaped than asiatics. Flowers are extremely long-lasting. Thicker petals are more weather resistant. LA hybrids perennialize well in most areas. These selections respond well to Sumagic® to control height for pot plants.